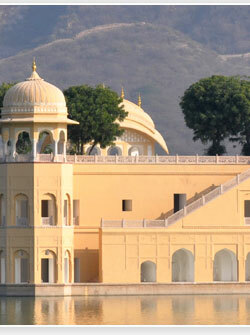 Jaipur, like the entire Rajasthan, loves color and pink more often than not. Amidst this riot of colors, the City Palace of Jaipur stands at the center.This royal residence is the tallest structure in the whole complex and received additions from various maharajas till all further additions were ruled out. But even before this, within sixty years of its construction, the City Palace had to accommodate a new extension of the zenana quarters. This was the Hawa Mahal. To the north of the city's main road intersection, the Badi Chaupad, stands Hawa Mahal - the world famous landmark of Jaipur, the best known specimen of fanciful architecture. Built in 1799 by Sawai Pratap Singh, the aesthete among maharajas, it is an integral part of the City Palace though standing away from the main complex. At first glance it looks rather whimsical in design. From the roadside, where most visitors view Hawa Mahal for the first time, it looks a mere facade. But there is much more than meets the eye. The upper floors are reached through a ramp rather than the regular stairs, a device to facilitate movement of palanquins carried by servants. This is a less tiresome way as the ramp ascends lazily to the top of the freestanding square tower. 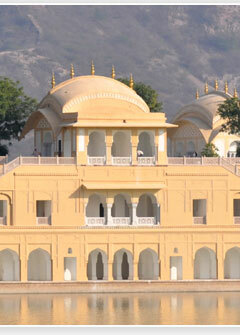 Imagine queens and princesses loaded with the heaviest jewelry and covered with the endless yardage of Clothes - skirts and sarees, climbing to the uppermost pavilion heaving and painting for respite from the sweltering summer heat. Here even the May-June winds feel so mild and cool. 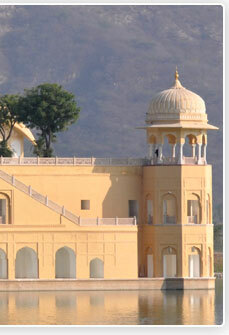 Jaipur itself appears in all its grandeur, with straight, wide roads, intersections and teeming crowds in the market. Jantar Mantar looks a collection of mystifying masonry instruments. The City Palace stands apart, surrounded by a maze of courtyards. 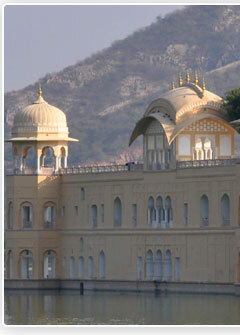 The Nahargarh fort, perched upon the hill, which slopes down sharply towards the palace, keeps its vigil over the city looks spectacular, a truly fairy-late setting. The facade of the Hawa Mahal has sometimes aroused unfair judgments as 'a baroque folly' and a 'bizarre piece of architecture'. 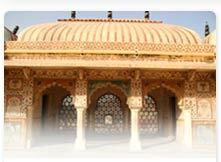 The five storeyed facade encrusted with elegant trellis work on windows and small balconies have 953 niches. Lal Chand Usta who designed the Hawa Mahal had dedicated it to Lord Krishna and Radha but its fanciful structure appealed to the Maharaja who found it ideal for the seraglio.